Accessed the archery range via a push button door lock 24/7. 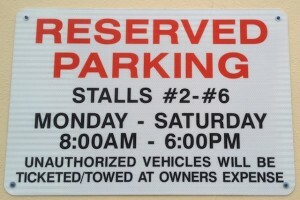 The parking stalls along the East side of the building are reserved for the mall’s business owners. 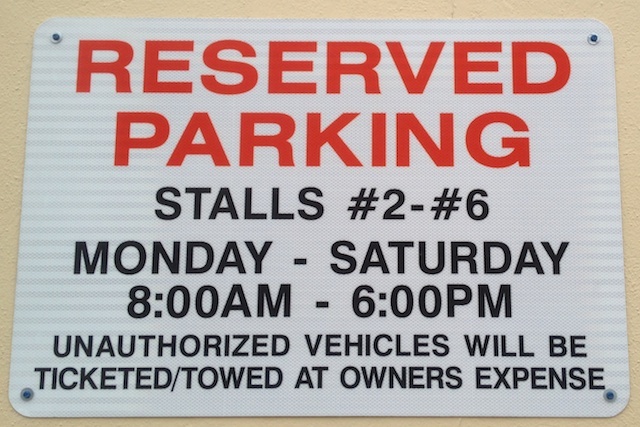 These spots are reserved from 8:00am to 6:00pm Monday to Saturday. DO NOT PARK in these spots during those times. Violators will be ticketed and towed at their expense. Inspect your equipment prior to shooting. Wait for others to stop shooting before you start approaching to retrieve your arrows. When approaching the target area to retrieve arrows, care must be taken not to contact an arrow remaining in the target and be aware of other archers as they remove their arrows from a target. The arrow may free up abruptly, so please be cautious. Always ensure that the archery target area is clear before shooting commences. Always face a target/wall when drawing a bow, never draw with anyone in front of you. Shoot roughly the same amount of arrows as other archers on the line. The Club is not responsible for the loss or breakage of your equipment while in use at the Club’s ranges. Members Only (No Guest Shooting – Frontier Bowmen SAA Card Required). All members are to sign in and out at the door. No Crossbows, broadheads or other firearms are allowed to be shot in the range. No drugs or alcohol are allowed at the ranges. No shooting is allowed while under the influence of drugs or alcohol. Please pay for all targets, drinks, chips or chocolate bars when you take them. You’ve cleaned up any mess you make in the range, kitchen, washroom or resting area. Appliances are unplugged (if you made coffee). You’ve removed your target and placed it in the recycling container. You’ve picked up any broken balloons you shot. You’ve placed your arrow stands back on the shelf. You’re turned off all the lights on the range. The club door is securely closed when you enter or leave. The door code is NOT to be shared and is for active members only. If you notice any unsafe conduct, abuse of Club facilities or potential hazardous situations – attempt to resolve the situation immediately or report it promptly to a member of the Executive. Misuse of the Club’s facilities will not be tolerated. Again, only Members are allowed to shoot and require that they have their Frontier Bowmen SAA card with them when they do. Any member can ask others members for their SAA card, as proof of membership.